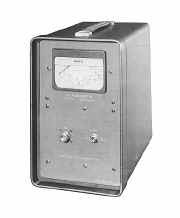 The TF 1152A and TF 1152A/1 are direct reading absorption watt meters for use at any frequency up to 500 Mc/s. Each has two measurement ranges of 10 and 25 watts full scale. They differ only in input impedance, which is 75 ohms for TF 1152A and 50 ohms for TF 1152A/l. These instruments measure mean power irrespective of waveform, the power contained in all harmonics up to 500 Mc/s being correctly summed with the power in the fundamental. The meters will therefore indicate the correct increase in power when amplitude modulation is applied to a c.w. input and thus percentage depth of modulation can be calculated. Another application is the measurement of the mean power output of pulse transmitters or modulators. The insulation of the input circuit is rated at 500 volts and this allows the application of peak powers of up to 3.3 kW for the 75-ohm version and 5 kW for the 50-ohm version. Their small size and light weight, and their freedom from internal batteries or external power supplies, make these instruments well suited for mobile use. Manual containing 20 pages including the Circuit with Component values.